Pictured: DRC presidential hopeful, Felix Tshisekedi during the launch of his campaign. Fears of electoral fraud are on the rise in the Democratic Republic of the Congo after officials said a total block imposed on internet connections and cellular message services after the chaotic presidential poll on Sunday could last for several days. Both the opposition and ruling coalition have claimed victory in the elections, the third poll since 2002 and the end of a civil war in which millions died. The election, which some observers hope may bring a measure of political stability to the vast central African country, was marred by widespread logistics problems, insecurity and an alleged outbreak of Ebola. Millions were left unable to vote. Barnabé Kikaya Bin Karubi, a senior adviser to the outgoing president, Joseph Kabila, said internet and SMS services were cut on Monday to preserve public order after “fictitious results” began circulating on social media. “That could lead us straight toward chaos,” Kikaya said, adding that the connections would remain cut until the publication of preliminary results on 6 January. The signal to Radio France Internationale (RFI), one of the most popular news sources in the DRC, was also down, and the government withdrew the accreditation of RFI’s main DRC correspondent late on Monday for having aired unofficial results from the opposition. Opposition activists said they believed the internet had been cut off to prevent people circulating information that could allow the official count to be challenged when it is announced. “It is very straightforward. They don’t want us to compile our own totals of votes,” said one Kinshasa resident who requested anonymity. Olivier Kamitatu, a spokesperson for opposition candidates, said the media crackdown was part of a “plan to obscure the truth of the ballot box”. The measures drew a sharp response from several western powers. In a statement supported by the United Kingdom and France, the European Union and the United States called on authorities to restore the internet and to allow the country’s two main election monitors, the National Episcopal Conference of Congo (CENCO) and Symocel, an alliance of citizens’ observer missions, access to the count. The election, which passed off mostly peacefully, could bring about the central African country’s first ostensibly democratic transition of power in its troubled history and chart a road to a better future. Others fear renewed instability if the opposition rejects the results and calls for protests. Already delayed by two years, the poll was postponed by a further week to allow more time to overcome logistical challenges in a country of 80 million inhabitants spread over an area the size of western Europe with almost no metalled roads. Kabila’s second electoral mandate expired in 2016 and he only reluctantly called new elections under pressure from regional powers. The constitution forbade him from standing again and critics claim he hopes now to rule through the handpicked government candidate, Emmanuel Ramazani Shadary. The president “congratulated” the Congolese people for having “accomplished their civic duty in peace and dignity” in a new year address broadcast on national television on Tuesday. “There can be no doubt. The DRC is not only a republic but a democracy too,” Kabila said. But analysts have long said the period after the elections would be more dangerous to the long-term stability of the DRC than the polls themselves. Opposition parties have pledged to oppose any result they see as fraudulent, promising to paralyse the country with a campaign of protests. “If the results during the publication of the presidential results don’t reflect the truth … trouble will break out across the city,” said Fabrice Shweka, a resident of the eastern city of Goma. In the poll on Sunday, Shadary, a hardline interior minister under EU sanctions for his role in a bloody crackdown on pro-democracy activists last year, faced off against two main opposition challengers, Félix Tshisekedi and Martin Fayulu. 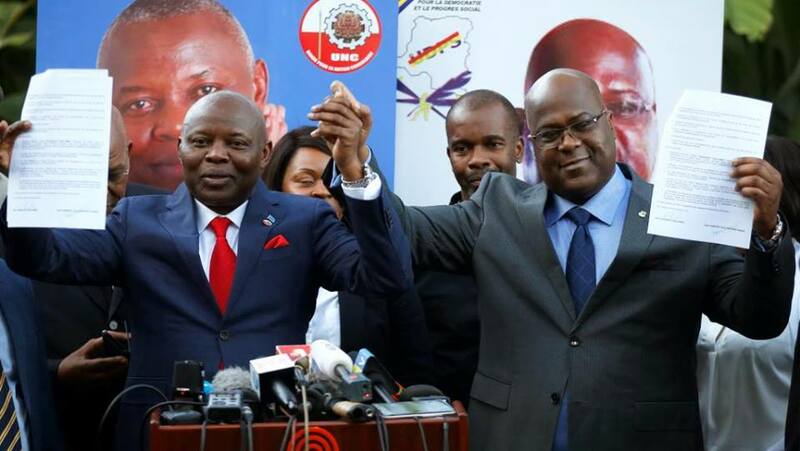 A survey shortly before the vote put Fayulu, a former business executive, ahead by more than 20 points. Shadary came in third on 19%. 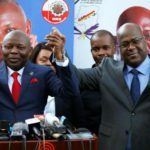 In a statement late on Monday, Fayulu complained about irregularities but said he was encouraged by the determination of Congolese people to vote despite long queues and voting machines that broke down. “I call for vigilance across the board and the general mobilisation of all Congolese so that the truth of the ballot box, the sole witness to the will of the Congolese people, can reward their efforts and sacrifices,” he said. Members of Fayulu’s campaign team have accused the government of ordering the shutdown to avoid broadcasting his “overwhelming victory”. The DRC refused international offers of help to conduct the elections, claiming it would compromise its sovereignty. Hundreds of polling stations opened hours late because they did not have the needed lists of registered voters. Many voters could not find their names on the lists and there were problems with more than 500 of the electronic voting machines. Many polls stayed open into the night to allow those waiting in line to cast ballots. At least one Kinshasa polling station did not open until after the official closing time. The government’s last-minute decision to bar millions of people in two opposition-stronghold cities from voting on Sunday, citing the deadly Ebola outbreak Around the city of Beni in the eastern part of the country, prompted protests.